Wild Emperor © 200? Casino Technology. 5-reel 21-line video slot. 'Wild Emperor' brings the exotic atmosphere from the epoch of the Great Roman Empire and era of the gladiators. The game is highly interactive : on the 2-level bonus the player may 'fight like a gladiator' into the arena and pass into the room of the beautiful Cleopatra. There he can feel like the Emperor himself with all the wealth he wins. Bonus game Gladiator : The screen shows Mark Anthony standing at the Coliseum's arena, ready for a fight.There are 5 doors around the arena: each one of them is hiding one of the Mark Anthony's enemies, or the Queen Cleopatra. Player chooses one of the five doors and every choice gives him a prize: Gladiator - 5 x Total bet; African - 7 x Total bet; Bear - 10 x Total bet; Lion - 15 x Total bet; Cleopatra - Second-level game.If Mark Anthony wins the battle, the player's prize is doubled. 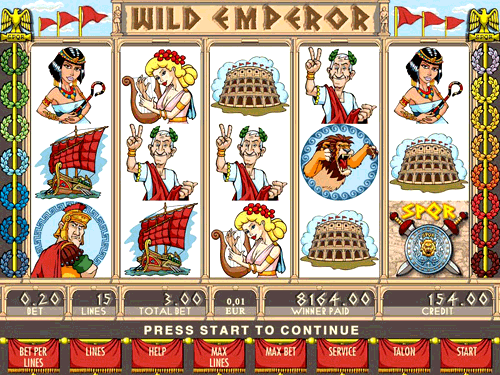 If Cleopatra appears from the opened door, the player passes to the next level. Bonus game Cleopatra : Appearing in the 'Gladiator' bonus game, Cleopatra invites Mark Anthony to her boudoir and the player passes to the next bonus level 'Cleopatra'. The screen shows Cleopatra's rooms with 12 objects situated in it. The Player may choose all of them one by one, opening different prizes : 2x, 3x, 4x, 5x, 10x, 100x or 1000x Total bet, or 'Collect' symbol. Depending on his Total bet value, the player quits the bonus at the 1st, 2nd or 3rd 'Collect'. The bonus win includes all the opened prizes plus one Total bet for each unopened object in the Cleopatra's room. The number of Collects allowed for opening is shown as Mark Anthony's heads at the right edge of the screen.